At FOLD Gallery Alicia Rodriguez finds two solo shows, shown at the same time in the same place, with works complete only in their incompleteness. 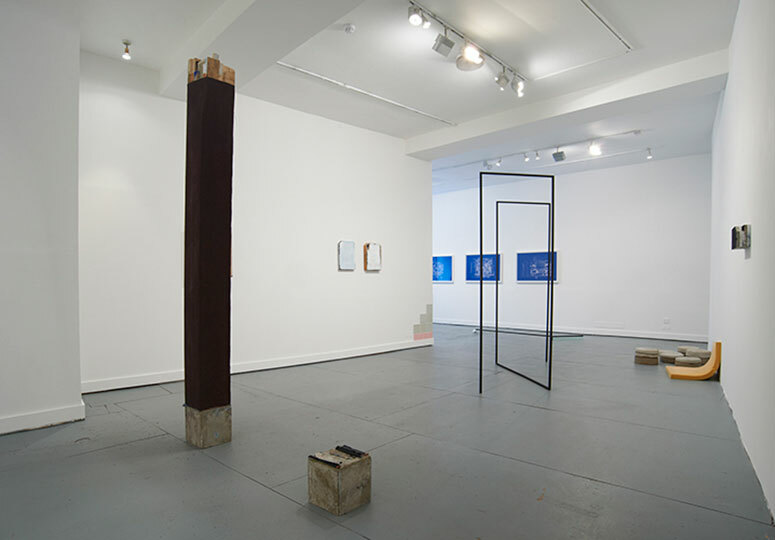 The delicate transition between the two shows simultaneously exhibiting at FOLD Gallery mirrors the process through which material becomes object in each artist’s practice. With no physical demarcation or indication between the two, Valérie Kolakis’s work flows seamlessly into Finbar Ward’s, inviting the viewer to consider a dialogue where both exhibitions interact, despite existing separately. In fact, this layout makes it nearly impossible to study one without being informed, somewhat, by the other. The choice to have two solo shows in one space creates a sense of something ongoing, as in a conversation, and is an enticing format. Valérie Kolakis’s show The Duration of the Sharp Hard Outline of Things pieces together elements of a hypothetical or yet-to-be-finished architectural project to construct a series of sculptures. The practical functions of familiar materials and processes are stripped away: for example, rolled up rugs that have been soaked in cement lean against the wall in Untitled (Rugs). Dry cement, its weight coupled with the weight of carpet, is decisive and quiet. The arrangement suggests something delayed, work that is put aside or abandoned. Follow the wall around and Tiles dissolves into view; highlighting the absence of a functioning room, this work is a simple consideration of completion and tactility. The pale grey and pink ceramic tiles are remnants that are redundantly affixed to an exterior corner of the gallery, applied however, with the care and precision necessary in an architectural context. Tiles recalls the pleasing, though ultimately displaced, demonstration displays in hardware stores. That these pieces, and many others in the exhibition, are of varying dimensions alludes to a continuous process. The ‘house’ itself is always in the early stages of being ‘built’, and never fully formed. Kolakis’s cyanotype blueprints further this by alluding to a fictional build with the authority of straight lines and utilitarian material. By decontextualising these materials, the prospect of physical space (and gallery space) itself is given transitional properties. Kolakis works with the familiar and has previously explored the unheimlich with specific relation to the construction of the home. This is executed, in her practice, through interventions within the gallery, often exploiting the metamorphosing nature of the gallery itself. In this instance, the ambiguous area where Kolakis’s exhibition ends and Finbar Ward’s begins furthers the process. The textures and surfaces of each artist mirror one another and respond to a deconstructed aesthetic. Ward’s exercise in painting is a discerning counterpoint to sculptural installation. Make Be More Than One Start is an example of painting as a process and the subversion of a finished piece. Like Valérie Kolakis’s incomplete house, Finbar Ward offers a series of paintings in the process of being formed. With an almost academic focus on material, Ward studies the familiarity and potential of the stretcher and the canvas. The paint (the stuff) becomes a form that is manipulated as part of an object. Rejecting the status of paint as a sacred tool for representation, he has articulated the very nature of it as a material. False Start (Other Half) includes a seductive layer of gloss and concrete on linen and somewhat references the appearance of a newly primed canvas. This allusion to production within a gallery context is simple and clean, offset knowingly with visible staples and nails. The work is exposed. In The Red extends 17cm away from the wall, and the linen is stretched around long timbers. The work is the colour of a tongue and reaches vertically towards the floor. The compression of the wood by the painted linen is visible where the fabric doesn’t quite cover it. Other stretchers are packed tight into single, minimal forms that function independently. This motif is raw and although it alludes to something unfinished, the work, at the same time, feels very conclusive. It is an effective approach, and presents the viewer with a painting as a ‘thing’ rather than a representation of a thing: the process suggests incompletion, but the material identifies the painting. Two very different exhibitions with similar intentions highlight an urban, familiar space that is constantly growing and changing. The materials used are meticulously chosen, and this is the primary strength of both shows. It is the material that determines the work and those materials are associated with the workshop, the home and the building site. They are also contextually associated with the gallery. These in-between spaces are always in-between. Both Finbar Ward and Valérie Kolakis suggest no finished product or outcome to a work of varying dimensions. Instead, the viewer is offered completion in a work constantly in a state of deconstruction.